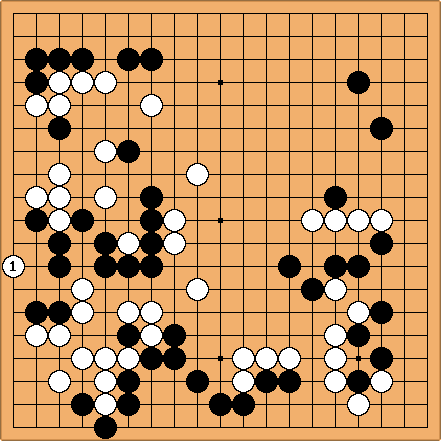 5 kyu guess: If white doesn't try to kill the black dragon on the left, I don't see how white can win this game. Even if the dragon lives, white can gain power in the center from the dragon's struggles and use this power to invade the top side and support white's four-stone finger on the right. Alex: I'm thinking that a splitting attack is the answer. Given that this is a tesuji problem, there might be some clever way to sweep out the base of Black's group on the right side - its shape certainly looks a bit sketchy. I'm don't have time to put much thought into it at the moment, though. unkx80: The left side deserves another look, but I don't think White can kill. From to , Black cuts off the White group. unkx80: Alex mentioned that there might be a tesuji on the right side. I guess the tesuji is , but I might have goofed somehow... going to sleep, continue later.